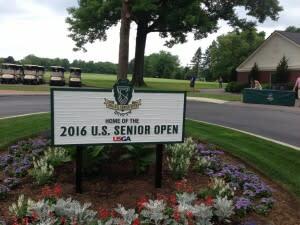 As he walked through the halls of the Scioto Country Club recently, on his way to a press event for the upcoming U.S. Senior Open, defending champion Jeff Maggert got some goosebumps. The Scioto Country Club is indeed chock full of history, and another chapter will be written August 8-14 as the top senior players in the world take to the links for the U.S. Senior Open. This is the centennial celebration year for Scioto, which opened in 1916 and is a member of a very elite group of clubs that have hosted five different major championships. Scioto hosted the U.S. Open in 1926, which was won by Bobby Jones; the 1931 Ryder Cup, won by the U.S.; the 1950 PGA Championship won by Chandler Harper back when the format was match play; the 1968 U.S. Amateur Championship won by Bruce Fleischer; and the 1986 U.S. Senior Open Championship won by Dale Douglass. And then there’s the Nicklaus connection. Scioto is the course where the Golden Bear polished his game under the direction of legendary teaching professional, Jack Grout. Scioto features the Jack Nicklaus Room, which has mementos from the Scioto Junior Championships he won in 1950, 1951 and 1954. There’s a painting of Jack, and the program from the testimonial dinner held for Nicklaus on July 15, 1959 – about two months before he won his first (of two) U.S. Amateur Championship. “This is a treasured place,” said J. Stuart Francis, USGA Executive Committee member. 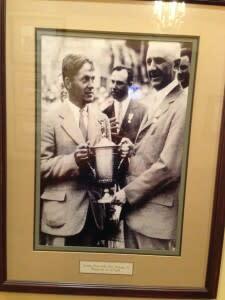 Further down the hall are photos of Bobby Jones, Gene Sarazen and Walter Hagen playing at Scioto. 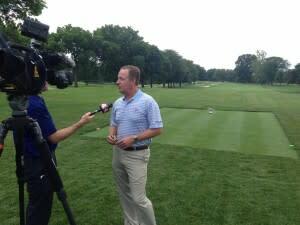 Local golf enthusiasts may be saying the same, and could flock to Scioto in record numbers. Some of the top names on the Senior Tour include: Tom Watson, Fred Couples, Bernhard Langer, Colin Montgomerie, Rocco Mediate, Jeff Sluman and Woody Austin. Scioto is considered a classic course. It’s 7,129 yards and par is 70. Maggert had a chance to tour the course and liked what he saw.